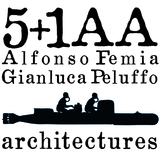 The architecture firm 5+1 was founded in 1995 by Alfonso Femia and Gianluca Peluffo, became 5+1AA in 2005, and operated until 2017. The office was focused on relationship between territory, city and architecture as the main way to confront the perception and the transformation of the contemporary urban scenario. In the projects by 5+1AA the designed space is always considered in terms of both its poetical and pragmatic implications. Apart from their prolific architectural activity, both in Italy and abroad, the architects have proved to consider the communication and narration of their projects as an important component of their works. They collaborated with various filmmakers such as ArtefactoryLab, Gabovideo, Attu Studio, Paolo Riolzi, Made on, Golem Images, The Piranesi Experience and Ernesta Caviola experimenting various approaches in the use of video. As a results 5+1AA video production assumes a not univocal character. 5+1AA was awarded in several competitions both in Italy and abroad, including the competition for the new Fiera Milano business headquarters (2008); the competitions for the redevelopment of the docks of Marseille and for the Officine Grandi Riparazioni Ferroviarie in Turin on the occasion of the 150th anniversary celebrations of the Unification of Italy (2009). The studio received numerous recognitions in the course of the years. In 2003 the firm was awarded with the title of "Benemerito" from the Culture and Art School of the Italian Ministry of Heritage and Culture for studio's research activities. In 2011 they won the Philippe Rotthier European Prize for Architecture for the Frigoriferi Milanesi project. In the same year they won the International Chicago Athenaeum Prize for the best global project of 2011 with "Torre Orizzontale", the new headquarters of the Fiera in Milan. In 2013 they were invited to participate in International competitions in Algeria, Germany and China, besides being entrusted for reconversion and residential projects in Morocco and in France. Thereafter, they worked on many Italian and International projects, including the El Sokhna Masterplan in Egypt, the redevelopment of the Marseilles Docks, the studies for the redevelopment of the Poste Brune in Paris, the IULM project in Milan and many others. In 2015 5+1AA, with MG-AU e Nexity, won the Gran Paris Express competition for the Creteil area.